Back in July, Elon Musk released to the public a set of conceptual designs that he and his teams at Tesla Motors and SpaceX drew up for a radical new long-distance, high-speed transportation system. Whilst full of brilliant ideas Musk just doesn’t have the time at the moment to focus on any more projects so he took the project as far as he was able, and then left it for someone else to pick up. 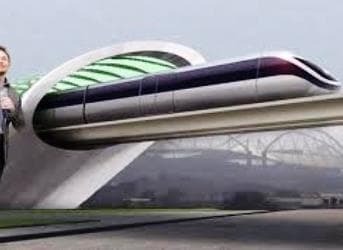 The transportation system was named the Hyperloop, and an old Oilprice article described it as working “in a similar manner to the old fashioned pneumatic tube delivery system, which would use suction to pull a capsule along the tube to the destination. After completing the initial concept, Musk handed the project over to JumpStartFund.com, where it will be crowd sourced and crowd funded by anyone willing to get involved. Whilst the ambition of Musk’s designs were applauded at first, there were also those that claimed that the Hyperloop would never become a reality, but proving those doubters wrong there are already several companies and prominent individuals who have attached themselves to the project, hoping to advance its development. The manufacturing and design company GloCal Network Corporation; SUPRASTUDIO, the Architecture and Urban Designs graduate program at UCLA; and ANSYS, are some of the companies that have joined the project, which is being headed up by Dr. Patricia Galloway, the first ever female president of the American Society of Civil Engineers, and Dr. Marco Villa, the former director of SpaceX. A company has now been officially created to further the development of the project towards actual production and commercialisation. The company has been registered as Hyperloop Transportation Technologies. Speaking to Fox News, Dr. Galloway, who has recently worked on projects to expand the Panama Canal, and to build floodgates around Venice, confirmed that the feasibility study has already been completed, and that now they are working on improving and refining the conceptual designs.